This advanced and fully-featured gas barbecue combines a sleek yet robust construction with our latest burner technology making it the perfect choice for anyone serious about outdoor cooking. Ideal for catering for larger groups, the Master 4 Series Classic is ideal for preparing a wide range of dishes and has the added benefit of a side burner for preparing sauces or side burners. 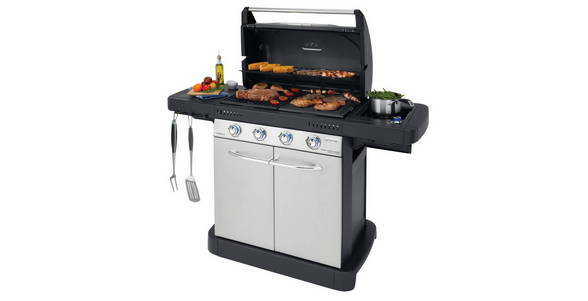 The Master 4 Series BBQ combines unique features including the innovative Even Temp technology for consistent heat across the entire cooking surface, the versatile Culinary Modular system which allows you to prepare dishes from paellas to pizzas, the reliable InstaStart electronic ignition, for dependable lighting every time and illuminated control knobs. Thanks to the 4 high-power stainless steel burners, combined with the new double-wall stainless steel lid, you will have the freedom to grill all year round, confident that you have the ultimate barbecue performance at your fingertips. The enamelled cast iron split grid and griddle brings extra cooking convenience and ensures great results, it is the best material to cook on, the cast-iron conducts heat more intensively and consistently than other materials, while the enamelled coating makes for easy cleaning. The Master 4 Series Classic’s stainless steel trolley comes complete with strong side tables and can also discreetly accommodate the gas cylinder to keep everything tidy.